Heat oven to 350 degrees. Cook beef in skillet over medium heat until brown; drain. Stir in beans and salsa. Heat to boiling, stirring occasionally. Place broken tortilla chips in ungreased 2-quart casserole. 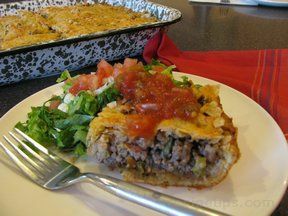 Top with beef mixture. Sprinkle with onions, tomato and cheese. Bake uncovered 20 minutes or until hot and bubbly. 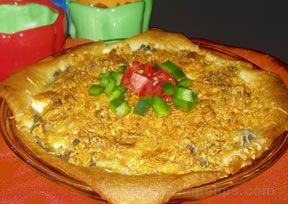 Arrange tortilla chips around edge of casserole. Serve with lettuce and salsa. Makes 6 servings.